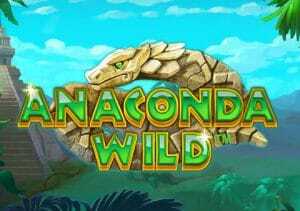 Giant reptiles from the jungles of America can deliver some top action in Anaconda Wild. Created by Playtech, it’s a 6 reel, 40 payline video slot that might not offer much in the way of bonus rounds but delivers plenty of action thanks to the Stone Serpent feature where slithering snakes serve up trails of wilds. Play on your desktop, tablet or mobile device from between 25p and £20 per spin. The deign in Anaconda Wild is pretty typical for a Playtech. It’s not quite the best of the best but it’s well above average. With dense rainforest greenery and a jungle pyramid in the background, you’ll see heart, diamond, club and spade symbols spinning around the reels next to a gold bracelet, a jade dagger, a primitive icon, a goblet and a treasure chest. The most rewarding of the standard symbols is the mystery woman. She will get you 20 times your bet if you land 5 or 6 on the same payline. More rewarding still is the wild. The replaces all other symbols and offers awards of up to 40 times your bet per payline. The wild also triggers the game’s only extra, the Stone Serpent feature. Whenever a wild lands, it will expand by 1 position in any direction to create a trail of wilds. This trail continues to grow until the serpent returns to the position in which the original wild landed. The Stone Serpent feature is the only extra on offer here. If you’re expecting a wealth of other bonuses, free spins or cash trails, then you’ll be better served looking elsewhere. This is a simple game but the trails of wilds that land at regular intervals mean that it’s certainly not a boring one. Land more than 1 wild on the same spin and some excellent action can result. Playtech has kept things pretty straightforward in Anaconda Wild and it works rather well. It looks great, the 6 reel game engine keep things ticking over and the extra trails of wilds offer some very decent potential. Even if you suffer from ophidiophobia, the Stone Serpent feature makes Anaconda Wild well worth a spin. If you like snakes though, Snake Rattle & Roll by Novomatic and Platooners by ELK Studios are worth trying.